No need to install. Place single EXE file on your USB flash drive and use it everywhere. Single EXE runs flawlessly on both 32 and 64-bit Windows 10/7/8/XP/Vista. When running on x64 Windows GeekUninstaller is running as a native 64-bit application. GeekUninstaller is a simple but powerful utility. It's written using Visual C++, TinyXML and Boost. Simple User Interface. Great-looking and surprisingly functional, GeekUninstaller will help you keep your computer clean and organized! Programs highlighted with purple orange color are recently installed/modified (since last run of Geek Uninstaller). Uninstall Windows Store apps on Windows 8/8.1/10. Use View menu or simply press Ctrl+Tab to switch between desktop and store apps. A very organized HTML file can be created that contains a list of all the installed programs. Geek Uninstaller lists each program's name, the date on which they were installed, and how much disk space they're occupying. If you right-click any program from the list, you can view it in the Registry Editor, open its installation folder, and search the internet for more information on the program. A program entry can be removed from the list of software if it's no longer installed but is still being shown as if it were. The total disk space used by all the installed programs is shown at the bottom of the program. Geek Uninstaller can forcibly remove a program if the regular uninstaller method doesn't work, which will scan the file system and registry for everything associated with the program and then let you remove them. I really like the export feature because the HTML file that's generated looks very nice. It's formatted in an easy to read layout and includes everything you see in the program - the name, size, install date, and total space used by all the programs. It also shows the computer name and date the file was generated, which is real nice to avoid confusion if you're doing this on multiple computers. 30-languages on board! Arabic, Armenian, Azerbaijani, Belarussian, Brazilian, Bulgarian, Chinese_Simplified, Chinese_Traditional, Czech, Dutch, English, Estonian, French, Georgian, German, Greek, Hebrew, Hungarian, Italian, Japanese, Korean, Latvian, Lithuanian, Norwegian, Persian, Polish, Romanian, Russian, Serbian (Cyrillic), Serbian (Latin), Slovak, Spanish, Swedish, Turkish, Ukrainian. 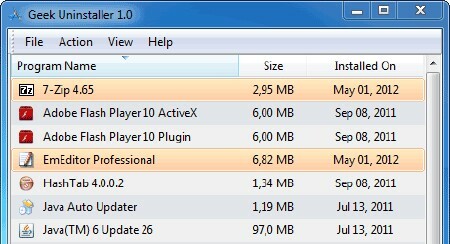 The bottom line is that Geek Uninstaller is a nice tool that can be quite useful. Inexperienced users shouldn’t have any troubles while working with this program, thanks to its intuitive layout and overall simplicity.